With location photography becoming ever more popular, there are many options for location lighting. The new Godox LP-800X is the easiest solution for location photographers and it is now available to purchase from Teamwork Digital. At just 6.2kg, this unit is much lighter than previous lead gel powered products and is extremely portable. It is able to power a 300Ws head for more than 1200 full power flashes or approximately 400 flashes with 3 heads plugged in. As well as three mains sockets, there are three USB sockets for charging phones, tablets etc. In “Flash” mode, the Godox LP-800X is specially designed for use with flash heads. It is also applicable to electrical appliances with rated power. However, in this mode, power saving function is not available so the the built-in battery can only stand by for between 13 and 20 hours. In “Normal” mode (non-flash mode), the use of flashes is not available. In this mode, the Godox LP-800X power saving function is available so that the built-in battery can stand by for up to 100 hours. The three AC output sockets are in parallel connection, and each is able output the maximum power. The socket is universal and applicable in all countries and regions. No adapter is required. 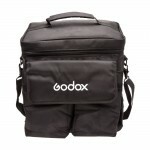 Included in this Godox lighting power solution is the power unit, a lithium battery, a charger and a fitted, padded carry case. 3 USB sockets for powering electronics, e.g. iPhone and iPad. Can be connected to an external storage battery to supply energy for longer. Continuous power supply up to 750W. Automatic protection against overload, short circuit, overheating. Buy yours now from Teamwork Digital for just £557.50 + VAT. 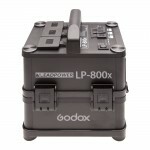 The Godox LP-800X is also available to hire from us. Please contact us via email or by calling our sales office on +44 (0)20 7323 6455 to discuss rental. Sekonic Offer - Cashback on light meters! Im thinking of buying one but l need to find out will my bx500ri and fx elinchrom lights work with this battery? With a Godox battery there will not be a need for dedicated battery-powered lights to shoot on location. 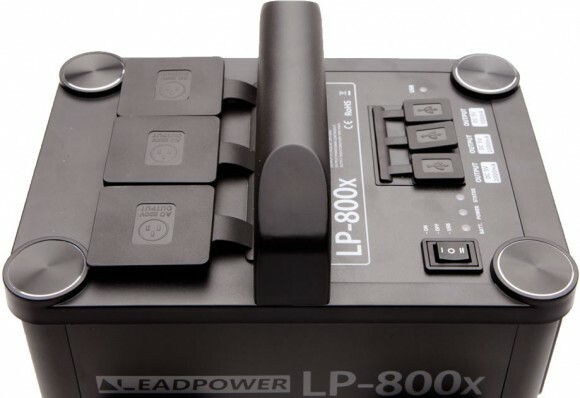 The LP-800X is a portable power inverter; optimised for simultaneously powering up to three flash heads, but also suitable for powering other 240v appliances, such as continuous lighting, laptops and fans. The inverter also includes three USB outlets for charging phones, electronic tablets, etc. Despite packing enough charge to power three 300w flash heads for 400 full power flashes each, the LP-800X is only about the size of a car battery and at 6.35kg is a fraction of the weight. If you need more power, then a separate interchangeable battery pack can be purchased, which takes mere seconds to swap in. Therefore, yes, Elinchrom lights can be used with the Godox battery but however charge duration will last for probably around 280 (estimate) full power flashes each. But there is an option of attaching a spare battery for longer duration full powered flashes. You can do all this providing the modelling lamp is off and not used, hence the high flash figures. Scenario 1: using 3 x 500w heads to one Godox battery = 280 full power flashes for each head (Estimate). Scenario 2: using 1 x 500w head to one Godox battery = 840 full power flashes for each head (Estimate). Or if you are using 2 x 500w heads to one Godox battery this would work out to 420 full power flashes for each head. Also do not connect other equipment i.e. laptops or phones whilst using monolight heads with the Godox, this scenario would not work. Hello wold the Godox LP-800X Lithium Ion Power Inverter work with stobes above 750W…? The test figure we have available is 200 shots on a pair of 500W monoblocs. So, in theory, yes but we can’t say for how long. Hi, I’m thinking of purchasing a Godox LP800X. I see it mentions connecting to an external battery/power source. can you tell me how this works as I cannot seem to find any info regarding this. There are a set of jump leads which allow the inverter & battery to connect to a car battery. These are currently available at £65.00 + VAT. I got the 750. I noticed quite heavy flash refresh rates with up to 6 seconds when my 1000 watt flash is connected. Is this better now with the 800? We have just heard from the distributor that they have tested with the ELC 1000 and got a recycle time of 1.2 seconds. What lights are you using? If you let us know, we will try and pin down a more accurate response for you. Thanks. I got the 800 one now. I got a Visio VC1000 and a VC600. The 1000 on its own needs 4 seconds. Combined more then 7 seconds. Dont listen to Godox. Even the manuel says max 3 seconds. This is so not true. By the way. The Godox also has a switch to use flash or normal mode. There is no difference if its on flash or normal timewise. Anybody knows the use of it? i have two elinchrom lights i brought back form the states i use them in the studio using a step down transformer .Would i be able to use the power back with these lights? 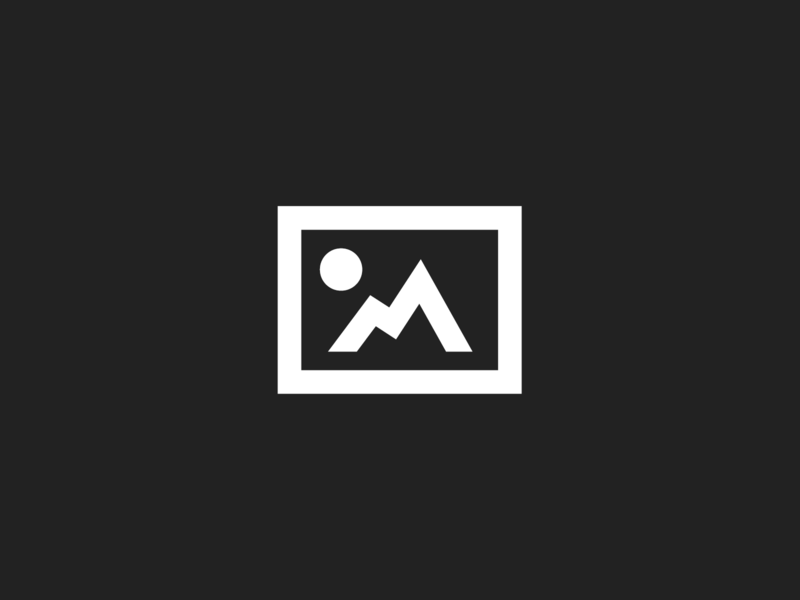 Win Capture One Pro 7 and other goodies!